Chris Family crowned Top Job Creator! 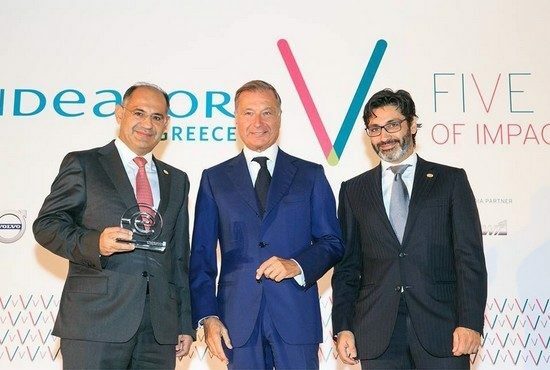 This year’s Endeavor award for Top Job Creator was given to Chris Family by Endeavor Greece’s Chairman Michael Chandris! Endeavor, global non-profit organization supporting entrepreneurship in 30 countries, has been actively supporting fast growing SMEs for five years in Greece. Endeavor presented its impact so far and its goals for the future at a special anniversary event, on Tuesday, October 3rd at the Hilton Athens Hotel. Edgar Bronfman, Jr., Chairman, Endeavor Global was the honored guest. The Ambassador of UK, The US Ambassador, all Endeavor network members and top tier business leaders were among the attendees. Two Great Taste Awards for Chris Family!